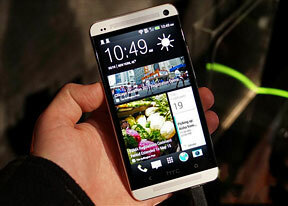 The HTC One comes with a brand new Snapdragon 600 chipset, which packs four 1.7GHz Krait 300 CPU cores. The same chipset is used by the LG Optimus G Pro, so let's see how they stack up. The BenchmarkPi shows a significant single-core performance boost over the older Krait cores (like in the HTC Butterfly and Sony Xperia Z). The HTC One adn Optimus G Pro are basically equal, however. The HTC One performed closer to phones with the old Krait cores than the Optimus G Pro in Linpack. The all-in-one Quadrant and AnTuTu benchmark scores are impressive adn have the HTC One and LG Optimus G Pro trade victories. The Snapdragon 600 chipset still uses the familiar Adreno 320 GPU (it's the 800 that upgrades to Adreno 330), but the higher clock speed used in the HTC One does make a difference. It's enough to put it at the top in terms of raw power - GLBenchmark 2.5 always runs at 1080p resolution regardless of the physical resolution of the screen, which makes comparison easier. But unlike most other phones, the HTC One needs it as 1080p is its actual screen resolution. Overal the HTC One is blazing fast in terms of CPU and GPU performance and will handle any app without breaking a sweat. The web browser performance leaves something to be desired though.